I prepared the batter and fillings the night before and leave them to rest in the fridge. I read somewhere that it relaxes the gluten in the flour. a slice of heaven went to Piggy gal..of course :) she deserves it! Add in the filling ingredients and mix well. Heat up the cast iron skillet pan with some olive oil over medium heat until hot. 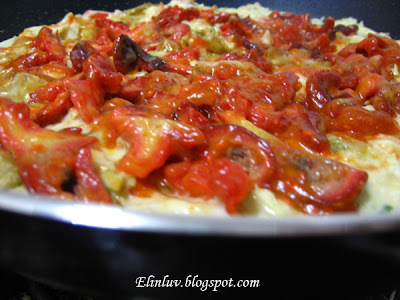 Pour the combined batter mixture on the pan and level it evenly to ½” thick. Add in the octopus and lightly cover the octopus with the batter. Allow this to fry till the bottom is set and lightly brown before you flip it over.Using a wooden spatula press it down . Repeat the flip action one more time till both sides are evenly browned. 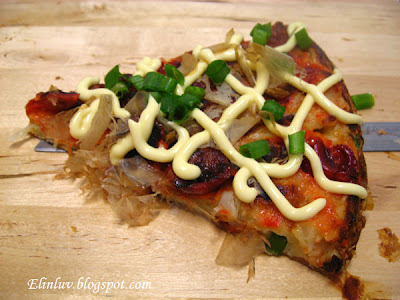 Take it out and squirts the Japanese mayo and the tonkatsu sauce on the top of the pancake Serve it while it is still hot. Great pics and recipe as usual! Your kids don't know how lucky they are! 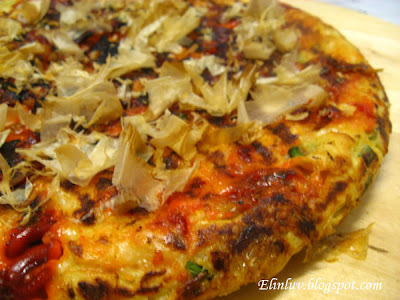 Okonomiyaki was "invented" almost silmuteanously in Osaka and Hiroshima, although the styles greatly differ. It was the only food available on stands in Japan just after WWII. You can imagine why it is still so popular! i think i'm gonna make this this weekend, hopefully my boyfriend enjoys it... but i can't find the marinated octopus (idako) so maybe i will substitude it with other seafood. yup, one of my fav Japanese snacks! 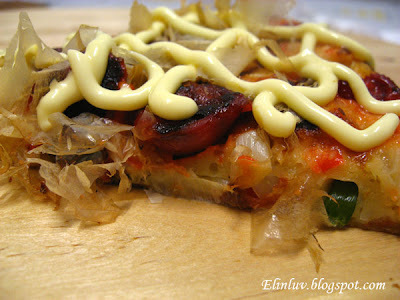 nice idea, putting thosee marinated octopus as topping. Hi Robert,we are blessed..kids love eating and the Momsie loves cooking & baking...good combo LOL..and thanks so much for the info on this jap pancake. Now it is not only popular all over the world but it has become popular overnite at the home of the Piggies too ^* It's a winner alright! 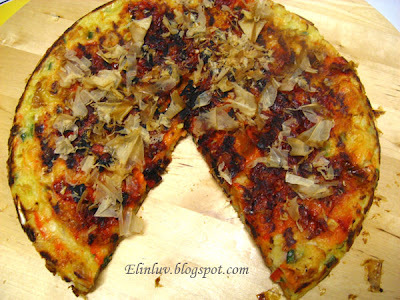 @J2Kfm : Haha...yup the idako and bonito makes a lot of difference to the pancake. My boy loves it and told his dad, eat this, mom makes the most nicest pancake LOL ! Great pancakes...and great way to eat veggies. The pictures are great. 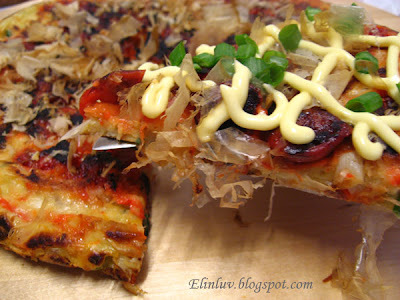 I've been seeing okonomiyaki on several blogs - I feel so left out as I seem to be the only person who's never eaten one before. 8-( I'd better make up for it! Ah ah ah I love how you told the experience with your piggies, so sweet :)) I must say, you are very courageous to get up so early, I am very impressed!! Hi Elin, I faced the same problem as Lynn. My batter was more like a dough than a batter. Is it how is should be?